SPX futures are pulling back from their overnight high and have turned red from yesterday’s close. Yesterday may have indeed been a Cycles turn date, but delayed by the algos. However, if their motive was to bring investors back into the market, they may have succeeded. Yesterday’s high clearly marked this rally as a Wave C of Wave (2). My original Wave count was correct. However, I allowed myself to be influenced by others who were a little less careful about Wave structure. Fibonacci now supports this view. The decline to 2593.07 took exactly 43 hours. The (expanded, irregular) correction took 107.5 hours, which is 2.5 times the length of Wave (1). The Wave relationships are also different, with Wave 3 being 2X the length of Wave 1 and Wave 5 being 3X the length of Wave 1. 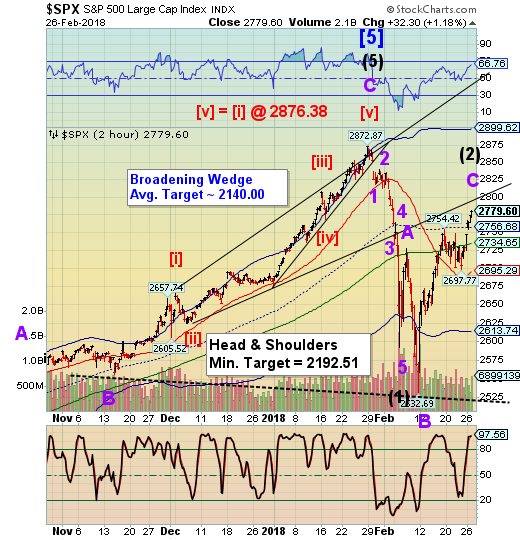 Should the Wave relationships continue under those circumstances, Wave (3) is likely to decline to or beneath 2200.00 and validate the Head & Shoulders formation, at the very least. There is a Cup with Handle formation which shares the Head & Shoulders neckline that suggests the Wave (5) target may be as low as 1565.00. NDX futures are also mildly down. All of the declining Waves to 6164.43 are impulsive, so I can only conjecture that yesterday’s rally may be Wave C of (2). General guidelines suggest that Wave (2)s are halted at the 61. 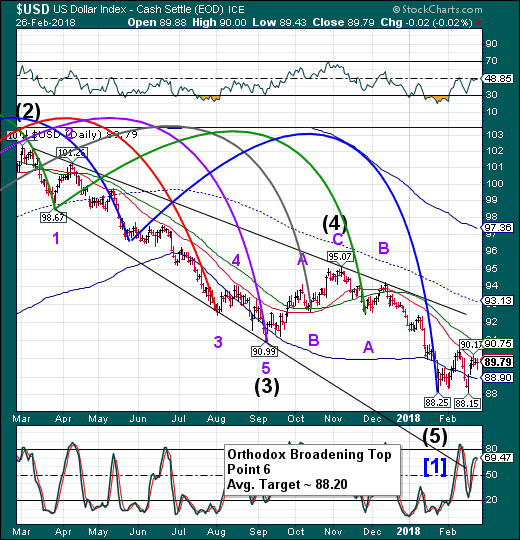 *% retracement and the Cycles Model guidelines suggest looking for the top of Wave (2) at mid-Cycle resistance. However, Wave (2)s may on occasion nearly or completely retrace Wave (1). This seems to be the case for NDX. The Fibonacci relationships suggest Wave (3) may decline to 5230.00, which is in agreement with the Head & Shoulders formation. However, these declines may expand, since there is no accounting for the overbullish, overleveraged condition the market is in. The Cup with Handle, which shares the Head & Shoulders neckline as its lip, suggests a total decline to the August 2015 low at 3787.23. VIX futures are higher this morning. 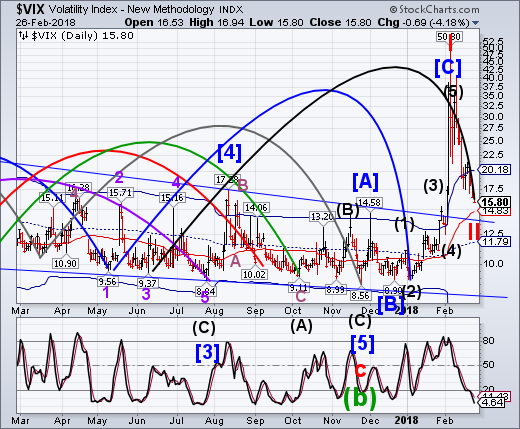 It appears that the expected Master Cycle low may have finally been made yesterday. TNX futures have been challenging the Cycle Top at 28.68, but appears to have pulled back after the Powell remarks. 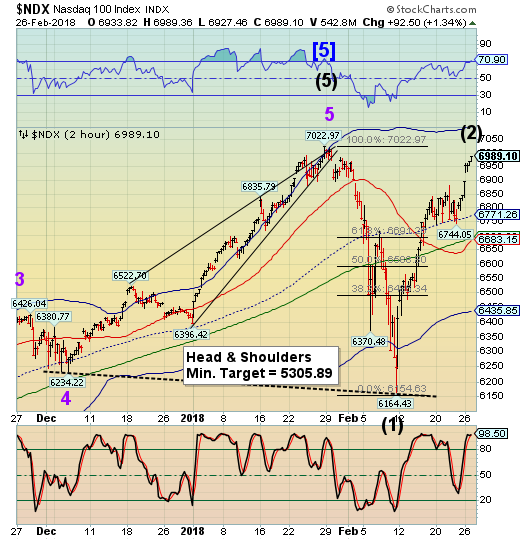 The Cycle Model suggests a 2-week decline in TNX that may approach the Head & Shoulders neckline. 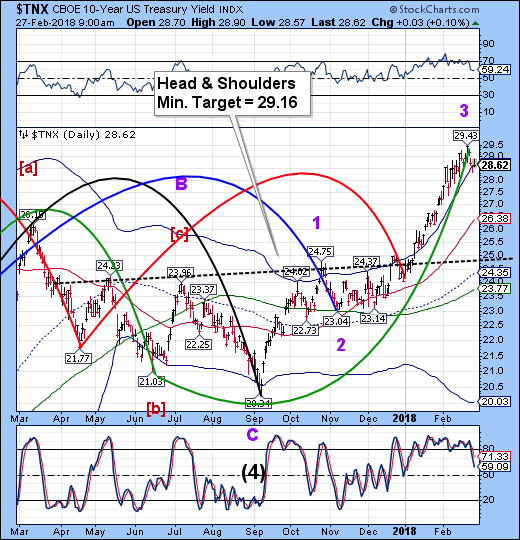 It is more likely that the decline may be stopped by Intermediate-term support at 26.38, which is just under the Lip of a giant Cup with Handle formation (shown on the weekly chart) that has a proposed target of 36.22. USD futures are starting to climb again with a potential breakout above recent highs in the making. ZeroHedge reports, “The euro is weakening and Dollar Index spiking (back above pre-FOMC Minutes level) following headlines from Buba President Jens Weidmann on ECB rate-hike guidance. USD/JPY is also on the rise.